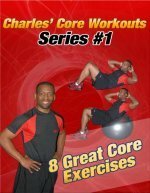 This page has some pilates ab exercises. Pilates is a great form of exercise for the core muscles and can strengthen the abdominals and lower back. With pilates, maintaing proper form and proper alignment is of the utmost importance. So go slowly and keep good form. Learn some pilates inspired flat stomach exercises from the video below and then include some of them in your core workout routine. This pilates workout begins with what Lorie calls the Straight Leg Stretch. The next exercise is Single Leg Stretch. Both of these exercises are good for flexibility and strength. The third pilates exercise is Double Leg Stretch. This exercise is really challenging on the abdominals, so it is important to be mindful of the position of your lower back. If you feel your lower back arching excessively, really engage your abs, don't lower as close to the ground, or rest and take a break. These first 3 ab exercises are inspired by pilates. The next 2 ab exercises are more like traditional ab exercises, but obviously there is overlap in many areas of fitness. The fourth pilates stomach exercise is Lower Leg Lifts. This move is similar to reverse crunches, leg lifts, or hip thrusts. The fifth exercise is Crossovers. Again, this is the same as bicycle crunches or the air bike exercise, and you will find this movement in many types of fitness routines. There you go. Time to clear a space on the floor and get working.